Chicken Chorizo Lasagna. Another deliciously different pasta dinner recipe! 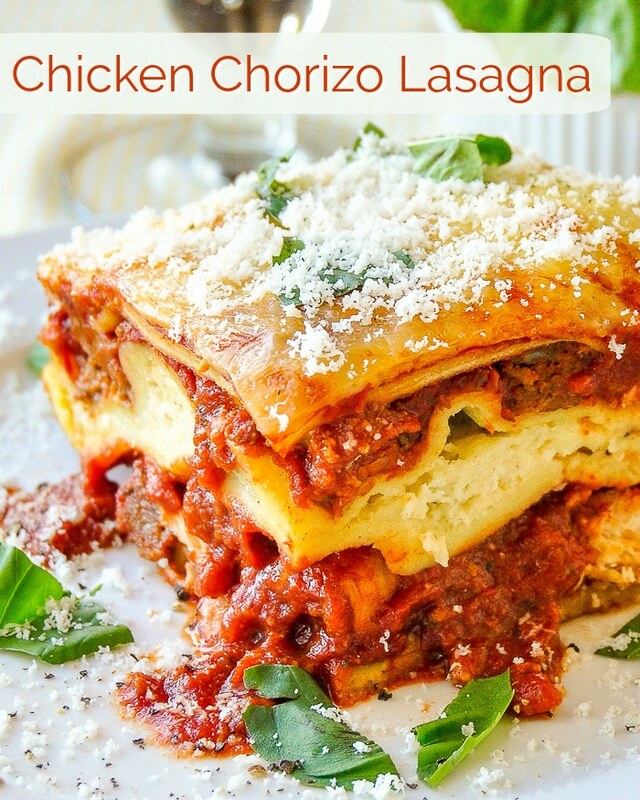 Chicken Chorizo Lasagna. Another of our deliciously different classic pasta dinner recipes with a super flavourful twist. This will easily become a new family favourite! This recipe comes courtesy of Spouse (who I’m told by my 9 year old, doesn’t get enough credit for her part in contributing to this blog). Spouse is an excellent cook in her own right and kitchen collaborations are a rule rather than an exception at our house. It was her idea to add chorizo to a lasagna recipe and this one is the result. 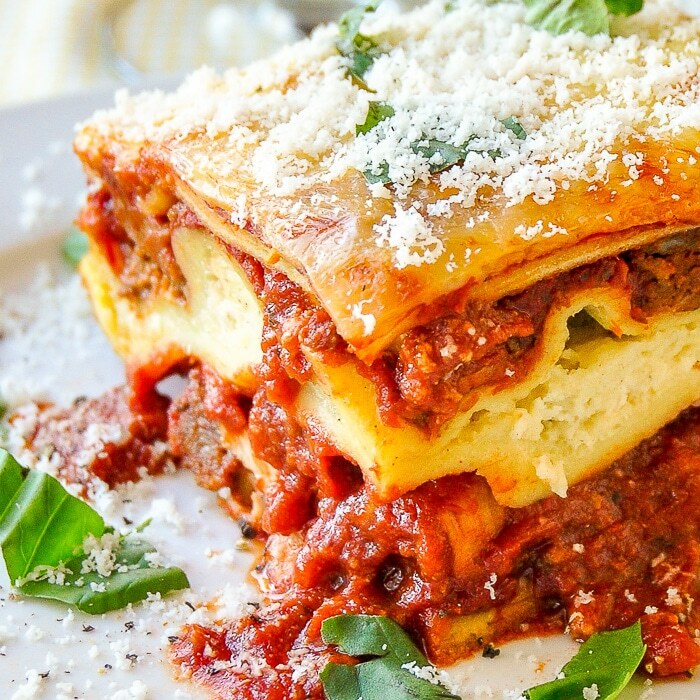 I love chorizo sausage and it does add great flavour to this delicious lasagna. You can use either fresh chorizo or finely chopped cured chorizo. Other spicy sausage can also be substituted too. (You can also very easily make your own just click here for our easy homemade Chorizo Sausage recipe. Easy Homemade Chorizo Sausage; Lower Salt & No Preservatives! Sometimes like in the photo above, we even use leftover diced grilled chicken instead of ground chicken which I actually prefer. You can use store bought lasagna noodles (fresh if possible) or make your own from the recipe provided below. If using dry lasagna noodles, I par boil them for 5 minutes before assembling the dish. 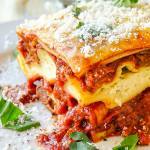 Like this Chicken Chorizo Lasagna recipe? If you enjoyed this recipe you may also want to try this incredibly popular pasta dish that our regular followers just love: Creamy Garlic Scallop Spaghetti. Combine flour and durum semolina and make a well in the centre. Crack your eggs into the well and using a fork to beat the eggs, slowly begin to incorporate the flour into the eggs until everything is combined into a very stiff dough. You may add a little water to incorporate the dry ingredients if necessary but be careful not to make your dough too loose; it should still be quite a dense dough. Add a little extra flour if the dough is too sticky. The dough should be slightly stiffer than play dough. Knead for 5 -10 minutes on a bread board, cover in plastic wrap and allow to rest for 20 minutes. Knead again and allow to rest again. You can use a pasta machine to roll the dough into sheets about 1/8 inch thickness or just a regular rolling pin on a well floured surface. Boil pasta sheets for 1-2 minutes in salted water before using in the lasagna assembly. In a large saucepan sauté the olive oil and garlic for 1 minute. Add the ground chicken, chorizo sausage and red onion. Cook until the meat has slightly browned. Add all of the remaining ingredients for the sauce. Slowly simmer for about 30-40 minutes or until the sauce thickens, stirring occasionally. Remove bay leaf. 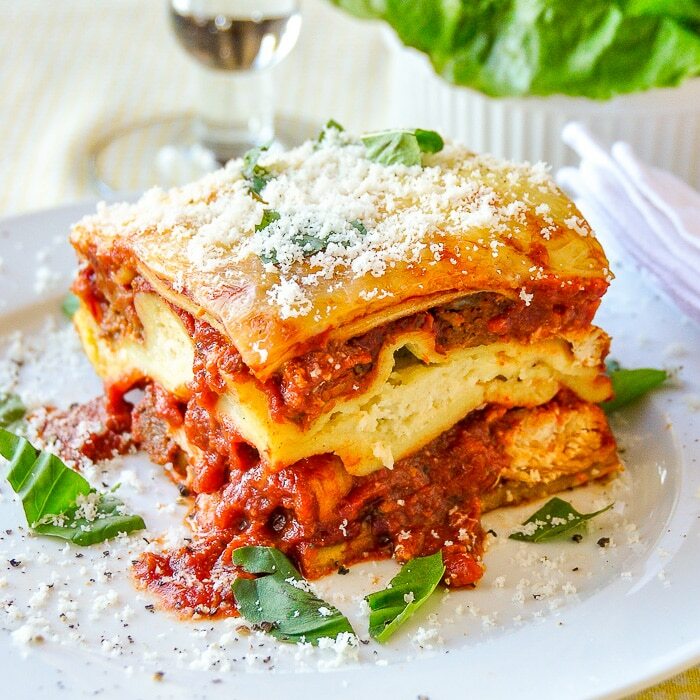 Start constructing the lasagna by adding a cup of sauce to the bottom of a large, deep lasagna pan about 9x13 or a little larger. Add a layer of pasta, half the remaining sauce, another layer of pasta, then the ricotta filling. Add another layer of pasta and the remaining sauce. Top with a final layer of pasta and the grated mozzarella cheese. Bake at 350 degrees for about an hour depending on the size of your lasagna pan. It is very important to let stand for 20 - 30 minutes before cutting and serving. This will allow it to settle, cool a little and make it easier to cut and serve. A lasagne, straight from the oven is always very sloppy to serve. NOTE : You can use store bought lasagna noodles (fresh if possible) or make your own from the recipe provided below. If using dry lasagna noodles, I par boil them for 5 minutes before assembling the dish. Previous Post: « Blueberry Scones, whole wheat and no sugar added. This recipe looks delicious and I want to try it. I don’t eat sugar or flour. Could I substitute zucchini noodles. If so is the any special steps to take. I’ve never tried that, but I can’t think of much different to do. I might suggest thick slices of zucchini instead though and maybe a thicker sauce to allow for the extra moisture.